The Frame by Samsung is about as pretentious as a television could be. It’s a $2,000 4K TV that doubles as a digital display for works of art. You can even hang it on your wall with a “no gap” mount and attach faux wood panels to the sides so that it looks like painting. Neat idea, sure, but inevitably, The Frame by Samsung is still just a television wrapped in a fancy sales pitch. I’ve spent the past couple of weeks with The Frame in my living room, and I’ll admit it’s a nice TV. Samsung actually calls it “The most beautiful TV you’ve never seen” in its marketing materials. The cheeky word play, I think, suggests that you could put this on your living room wall, and nobody would know that it’s actually a full-featured television. The unique art mode allows you to select prints, paintings, or photographs to display on the screen when the TV’s power is off. There’s also a motion sensor on the front that can display the art only when someone’s nearby, so that you’re not wasting electricity. Again, cool concept. I’m not sure the tech is quite there yet, though. The 55-inch model costs $2,000 and the 65-inch is $2,800. I want to make these numbers very clear, because they’re big, and the cost-to-value ratio played a major role in my opinion of the Frame by Samsung. Put bluntly, these TVs are too expensive. That said, the TV part of the package is actually quite good. The 4K edge-lit LED display is clean, crisp, and luxurious. It features a 120 Hz refresh rate and a 240 Hz motion rate. (The refresh rate refers to how many times the image on the screen refreshes, and the motion rate is software that inserts frames between the actual refresh rate to make the picture seem smoother. This often creates something called the “soap opera effect.”) You’ve also got HDR Pro, which is a marketing term Samsung and other manufacturers use to imply that the color range of its TVs provide some of the benefits of HDR but don’t quite hit the HDR10 standards for peak brightness. The display also lacks local area dimming, the feature that provides multiple zones where the backlight can either highlight bright colors or turn off completely to produce blacker blacks. Nevertheless, the contrast and color quality is still good. The software side of things is also good. The Frame runs Tizen 3.0, the latest version of Samsung’s proprietary operating system. 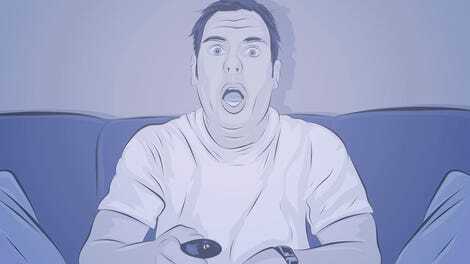 You can do the things that you do with any smart TV, like install apps and access the internet. There’s also an app to control the TV’s Art Mode. The Frame comes with 100 works of art from 37 artists, and there’s an art store where you can buy more through a dedicated smartphone app. You can also upload your own photos or images to display on the screen when the TV is in Art Mode, again, by using the smartphone app. Thing is, the primary selling point of the Frame isn’t just about being a high-quality display or a full featured smart TV. It’s about the complete package and the aesthetic appeal it offers as a medium for artworks. And since the display itself is roughly equivalent to those in cheaper Samsung TVs, you’re definitely paying a big premium for this wannabe haute couture hardware. Here’s the corner of the Frame with the optional “customizable bezel” partially removed. The black bezel underneath is what the naked TV looks like. The decorate white bezel snaps on with magnets and costs over $200. The Frame is a graceful object—I’ll give it that. It’s essentially an obelisk, around two inches thick and flat on the back so it can sit flush against the wall when you use the no-gap mount. Due to a legal agreement with my landlord (my lease), I was not able to mount the Frame, but I can appreciate the minimalist appeal of a TV that just looks as clean as a painting in a mid-century art studio. 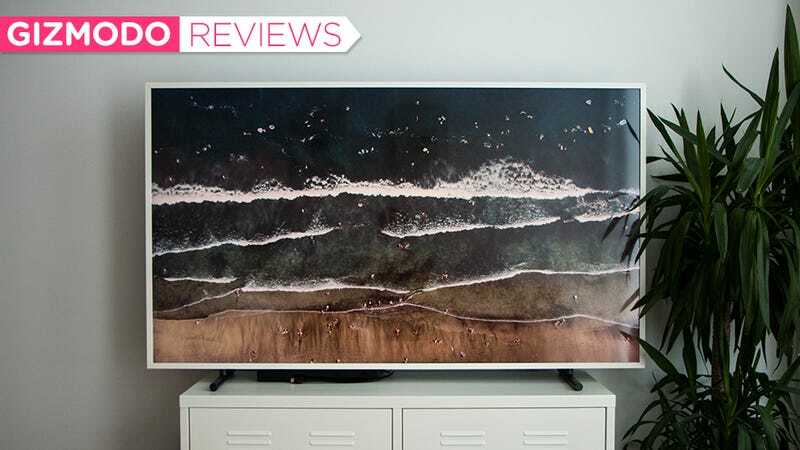 Out of the box, the Frame has a thin, black bezel, but you can buy a customizable bezel with a walnut, beige wood, or white finish for an extra $200 or $250, depending on the size of your TV. The decorative bezel snaps right on to the TV using magnets and takes about 60 seconds to install. But you’re also paying hundreds of dollars for pieces of decorative metal. Once it’s all set up, though, the Frame is a handsome piece of hardware. Even when it’s not mounted, the TV just floats like a portal into whatever fantasy world your movie of choice wants to take you to. These are the only cords that come out of the Frame. They plug into the One Connect Box that you can stash out of sight. What’s especially impressive is the One Connect cable and box. This system uses a noodle-thin cord that connects the port-free TV to the separate One Connect Box, where your HDMI, optical audio, USB, and other cords go. In other words, you plug one tiny cord into the TV and that connects to the slim box with all the inputs, a little slab you can hide in a console or anywhere nearby. The only other cable that comes out of the TV is the power cord. So even if you’re not mounting the Frame and instead using the sturdy, almost industrial stand that comes with the TV, you can maintain that minimalist appeal. Even the muted colors in Gangs of New York pop on the Frame’s high quality display. All that said, I can’t get past the fact that Samsung is trying to sell you a TV that doubles as a display for art. The Frame just doesn’t work for that. 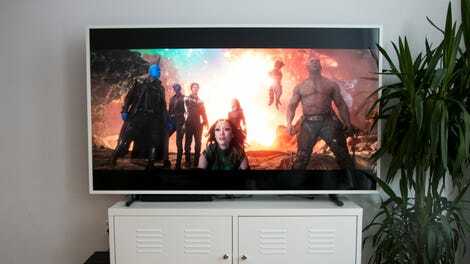 The screen itself has that dull glossy sheen that most TVs have, and when the TV is in Art Mode, it’s dreadfully obvious that it’s just a digital image on an edge-lit display. If you install the Frame anywhere near a window, as I did, you’re going to see glare on the screen almost always. So there’s no fooling me or my guests that there’s now a painting where my TV used to be. It just looks like a really nice TV. Even with shades down, the glare on the display robs Art Mode of some authenticity. For some people, that might be okay. I can see how the Frame might be wonderfully appealing for the lobbies of fancy office buildings or as incognito sports-watching installations at nice restaurants. In those instances, the TV as an object is more of a business expense anyways. It almost looks good, too. From a distance, the effect of Art Mode on the Frame was somewhat uncanny, as if you were looking at a weird print in a shiny package. Once you get close up, however, the illusion completely falls apart. The fake matte looks very fake and, for some reasons, fields of white always look a little pink. In the end, you can buy an equally good TV for much lower price—even one made by Samsung. As CNET points out, the Frame’s specifications “are roughly equivalent to the [Samsung] MU8000 series of 4K TVs.” Those TVs are $700 and $1,000 cheaper than the 55-inch and 65-inch Frame TVs, respectively. Just recently, Samsung also announced a 43-inch version of the Frame but didn’t specify the price. So it’s not so much that Samsung made a bad TV. It’s the fact that the Frame’s marketing doesn’t quite live up to the product’s promises—or price. Still, the display itself looks great. Would I recommend the quality of the display in the Frame by Samsung? Absolutely. Would I encourage you to install it in your foyer to impress your friends or please some inner yearning to have a more future-focused approach to interior decoration? Almost. Would I encourage you to spend an extra thousand bucks to get a TV that promises to be a work of art? I would not.